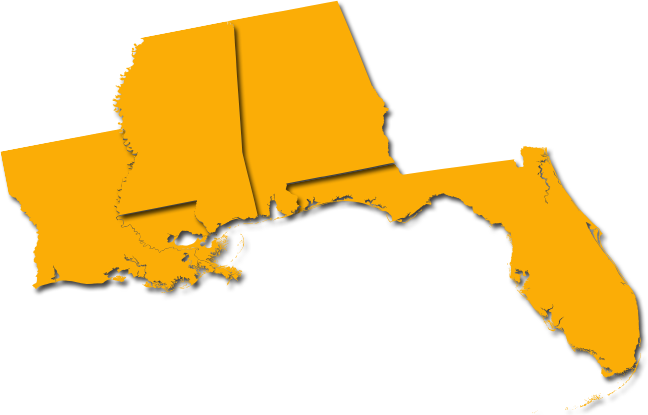 Four of NASA’s most significant and historic space centers, Kennedy, Marshall and Stennis, as well as the Michoud Assembly Facility reside in the region employing thousands and impacting hundreds of associated industry partnerships and aerospace business start-ups. In addition, some of the most innovative commercial space companies in the world routinely launch sophisticated payloads into space from Florida’s Cape Canaveral. The four member states of the Alliance each support extensive defense-related assets important to the industry and who generate a portion of the skilled workforce through military separatees and retirees. Alabama – Alabama is home to 4,200 aerospace engineers in the state, ranking 5th in the nation. Mississippi – Every commercial airplane in the world has had at least one component made in Mississippi. Florida - Florida aviation and aerospace businesses export more than $5.2 BILLION in goods annually. Louisiana – Louisiana Economic Development’s FastStart® is the nation's best state workforce training program, according to Business Facilities magazine. Columbus Air Force Base in Columbus, Mississippi.